The San Francisco Browning Society will present Leslie Friedman on Friday, May 8, 2 p.m. at The Sequoias, 1400 Geary Blvd., San Francisco. Dr. Friedman will give a talk about the creation of her dance, WHY? BECAUSE, and its relationship to World War I. She will also show the dance. 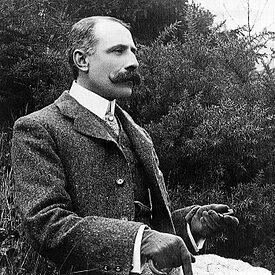 The music is Sir Edward Elgar’s ‘Cello Concerto, the Adagio and Allegro movements. This two part dance was premiered as part of Dances at the Henge, part of the official programming of Britain Meets the Bay, organized by the British Council, in San Francisco. Tributes to this extraordinary dance have come from critics and audience members alike. Leslie Friedman received the Best Solo Performance Award from the Dean Goodman Choice Awards, 2001, for her performance of WHY? BECAUSE. This entry was posted in Hedgehog Highlights, Lively Foundation News & Events and tagged choreography, Contemporary Dance, Dance lecture, lecture event San Francisco, Leslie Friedman, San Francisco Browning Society, Sir Edward Elgar, The Sequoias San Francisco, Why? Because, World War I on April 29, 2015 by Leslie.